MSR Twin Sisters Tent. The ultralight, floorless Twin Sisters shelter offers the enclosed protection of a tent with the weight of a tarp. 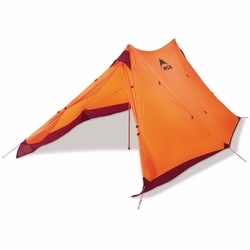 It pitches quickly with included poles or optional trekking poles and easily covers two people plus gear. Two doors offer easy access and cross-through ventilation, while a snow skirt, DuraShield coatings and optional footprint provide maximum protection in any season. Full Protection: Steep roof, perimeter snow skirt and DuraShield� coatings help seal out the elements.